On March 27th 2019, India joined the elite club of nations who posses an anti-satellite technology. The technology mission (Mission Shakti) was led by Defence Research and Development Organisation (DRDO) to strengthen India’s overall security. The capability of attacking a satellite in an orbit closer to Earth shall give a tactical edge to the country. ASAT are space weapons designed to incapacitate or destroy satellites for strategic military purposes. Space weapons can attack space weapons in orbit (ASAT), attack targets on the earth from space or disable missiles travelling through space. ASAT missiles are of two types – Kinetic or Non-Kinetic. Kinetic A-SAT physically strikes an object and destroys it like ballistic missile. Non-Kinetic A-SAT use non-physical means to disable/destroy a space object like frequency jamming. 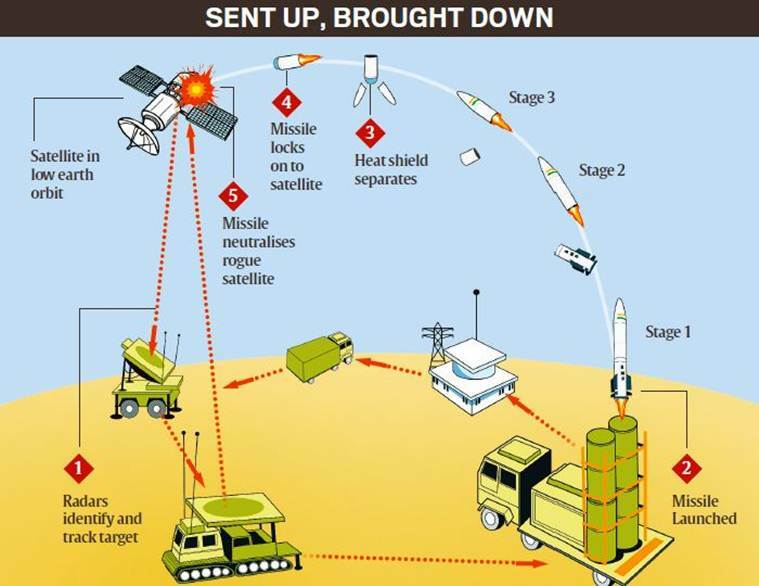 The theoretical range of A-SAT weapons is limited to 20,000km. The capabilities of ASAT have been demonstrated by United States, Russia, China and India. Israel is said to be on the path of developing its ASAT technology. Intercept, jam communication or military satellites of enemy countries. Access critical information about troop movements or incoming missiles. Launch cyber-attacks on space systems and direct laser-based weapons. ASAT weapons technology is complicated involving highly reliable surface-to-air ballistic missiles and long-range radar and tracking systems. 1959: USA performs first anti-satellite test. An air-launched ballistic missile was fired from B-47 bomber at Explorer VI satellite. 1963: Soviet Union acquires ASAT technology. 1985: America tested AGM-135, launched from a F-15 fighter jet and destroyed its own satellite Solwind P 78-1. 2007: China enters anti-satellite arena. It destroyed old weather satellite in a high, polar orbit. 2008: USA carried out Operation Burnt Frost to destroy a defunct spy satellite. 27th March 2019: India became the fourth nation to acquire ASAT technology. As part of the mission, an anti-satellite (A-SAT) weapon was launched and targeted an Indian satellite which had been decommissioned. Mission Shakti was carried out from DRDO’s testing range in Odisha’s Balasore. India is only the 4th country to acquire such a specialised and modern capability, and Entire effort is indigenous. Till now, only the US, Russia and China had the capability to hit a live target in space. A large number of crucial applications are now satellite-based. These include navigation systems, communication networks, broadcasting, banking systems, stock markets, weather forecasting, disaster management, land and ocean mapping and monitoring tools, and military applications. The ability to bring down an enemy’s missile, therefore, gives a country the capability to cripple critical infrastructure of the other country, rendering their weapons useless. India’s space programme is a critical backbone of India’s security, economic and social infrastructure. Mission Shakti has ensured that India secures a place in the space power league by shooting down the satellite which was orbiting at an altitude of 300 km. Space debris, also called space junk, artificial material that is orbiting Earth but is no longer functional. Anything launched into the space remains in space, almost forever, unless it is specifically brought down or slowly disintegrate over decades or centuries. With countries launching more and more satellites, each one of them being a strategic or commercial asset, avoiding collisions could become a challenge in the future. According to the European Space Agency, there were an estimated 7,50,000 objects of size one cm or above in space. A satellite that is destroyed by a missile disintegrates into small pieces, and adds to the space debris. The threat from the space debris is that it could collide with the operational satellites and render them dysfunctional. According to the ESA, space debris is one of the principal threats to satellites. The successful development of ASAT technology has improved India’s space power. It has demonstrated its capability to intercept any satellite. So, it has created a deterrence mechanism for its space satellites which are doing various military and civilian services.